NEW! O&O Defrag 22 Pro - Optimize SSDs and HDDs With The New SOLID method! Introducing the latest version of our tuning application with a new method to optimize the performance and lifespan of SSDs. 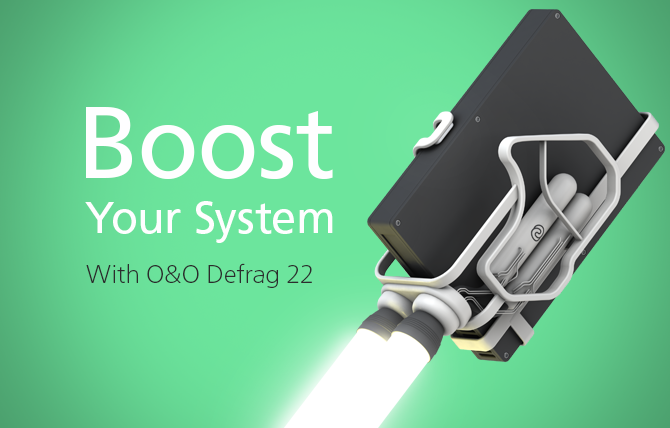 Our new O&O Defrag 22 Pro is now available with some groundbreaking new features! Windows – and in the case of SSDs, the controller of the SSD – distributes files into individual file fragments when saved, in each case in the next free and “suitable” memory sections, called Pages. In the remainder of this blog entry, I explain why this behavior slows down not only a classic hard drive but also SSDs and ultimately leads to an unnecessarily early failure of the storage medium. And I’ll explain why defragmenting an SSD is not a no-go, as is still popularly claimed, but on the contrary: the average life of an SSD is extended by defragmentation using the new SOLID method from O&O Defrag 22. How is an SSD structured? An SSD consists of cells, pages and blocks. A cell can be several bits in size. The manufacturer marks this cell with either SLC, MLC or TLC. The SLC are the SingleLevelCells (1 bit per cell), the MLC the MultiLevelCells (from 2 bits per cell, but mostly exactly 2 bits and TLC are the TripleLevelCells (3 bits per cell). Pages are made up of cells and typically have a size of 2KB – 4KB. The Blocks then consist of these pages, and usually have a size of 128KB – 512KB. How does an SSD store data? Writing data to an SSD is essentially done in Pages. However, these pages should not already be written with data (not even if they have the same content). If these pages are written with data, the corresponding block must be deleted immediately before any new data can be written. When writing new data however, no block can be selected whose other pages also already contain data. The SSD Controller can see that the other pages contain data, but cannot see to which file they belong. So in a nutshell, in order not to accidentally damage an important file by deleting data from it on the block, you have to search for an entirely free block to save data on. Why is fragmentation problematic with SSDs? Files are often stored in pieces (fragments) onto the disk or onto the file system. The size of the fragments depends on the cluster size of the respective file system (normally 4KB in NTFS). Let’s assume a block on our SSD is 128KB and a file (128KB) that is split into 32 fragments needs to be saved (you recall, each fragment will be 4KB large). In the worst-case scenario, this would then have to be saved on 32 different blocks. If this file had only one “fragment”, one single block would be enough. The problem then with writing such a fragmented file: The controller has to find 32 FREE blocks and, in the worst-case, delete them all. Then it must write to these 32 blocks as well – and this must happen every time a file is changed too! The problem: SSDs store file fragments spread across many blocks, even though much fewer would suffice. This memory behavior has an immediate effect on the performance and lifespan of an SSD. To counteract wear and at the same time to optimize the performance of SSDs, O&O Software has developed the new defragmentation method SOLID. By using the defragmentation method SOLID, these distributed file parts are defragmented so that in the future significantly fewer memory cells have to be read out and also written to when changing a file. As a result, the SSD is faster as the number of read and write accesses is reduced by the defragmentation. In addition, the premature wear of the SSD (and of course the conventional hard drive) is prevented because fewer blocks need to be erased and rewritten than before the defragmentation with SOLID. To stay with our example above: To read our sample file, it is not necessary to first access and read 32 different blocks, but only a single one. A positive side-effect of developing the defragmentation method SOLID has been found in tests on “classic” hard disks: it is O&O Defrag’s most resource and hardware-friendly defragmentation method ever, with optimal results, and sets the new standard for defragmentation. As we mention above, files are also fragmented on SSDs. Data is often distributed to more memory cells than would be necessary. By defragmenting an SSD using our new method SOLID, it is possible to reduce the number of cells used to store file parts down to significantly fewer. Let O&O Defrag 22 Pro optimize your hard disks and SSDs, and you will get more speed while at the same time saving money on your hardware. Don’t just take our word for it! Grab your copy now in our Online Shop, or alternatively test it for 30 days now on your current Windows system – free of charge and obligation. As well as the new functions, the old and trusted features for speeding up your PC and extending the lifespan of your hardware are all there too. Jim Harrison has a very broad sales and account management background, having previously been employed by various international companies in both senior sales and customer service roles. He joined O&O Software in March, 2006 in a sales and localization capacity, and having quickly recognized the potential for O&O Software worldwide, he was appointed Director of Sales International in 2008. Jim and his team focus on developing long-term, strategic partnerships in order to bring the O&O brand and product range to more and more international markets. Developing primarily the European, North American and Asian markets, his aim is quite clear: to have an O&O product installed on every computer, worldwide! Ich habe das Upgrade auf Version 22 gekauft und installiert. Leider ist von einer Defragtechnik SOLID weit und breit nichts zu sehen, es stehen nur die üblichen zur Auswahl. Wo also finde ich SOLID? Vielen Dank für Ihr Vertrauen und Ihre Nachricht! Die Funktion finden Sie im Ausklappmenü der Start-Funktion im Hauptfenster. Alternativ können Sie auch ein oder mehrere Laufwerke auswählen und dann Shift+F12 drücken. Sie haben Zonen aktiviert, richtig? Bei aktivierten Zonen stehen nur die OPTIMIZE-Methoden zur Verfügung. Technisch hat dies den Hintergrund, dass diese Methoden die Zonen berücksichtigen, SOLID hingehen würde dies nicht tun. Soweit ich weiß, nicht. Wenn ich unter Zonen konfigurieren nachschaue, sind dort keinerlei Regeln hinterlegt. Wie könnte ich diese denn deaktivieren? Ich finde keine Möglichkeit dazu. Genau wie bei Dirk. Trotz deaktivierten Zonen von SOLID keine Spur. Woran liegt es denn nun? Lösung: Das Zurücksetzen bei “Zonen konfigurieren” bringt nichts, man muss unter allgemeinen Einstellungen bei erweiterten Optionen den Haken entfernen bei “in Geschwindigkeitszonen einteilen”. Korrekt. Ich muss offen gestehen, dass ich selbst diese Einstellung nicht sofort gefunden habe. Wir haben bei uns daraus jetzt mal einen Verbesserungsvorschlag erstellt, so dass in einer zukünftigen Version diese Einstellung besser zu finden ist. that are usually locked or heavily utilized. die meist gesperrt oder stark ausgelastet sind. Many thanks for your question. The method used during boot time defragmentation is fixed to the Stealth method and cannot be changed. Stealth is the best method for an initial Defrag, where few resources are available, for servers with large disks and PCs with a lot of files. Thanks you for your continued support. Es wundert mich, dass einerseits O&O die einzige Firma zu sein scheint, die meint, in der Lage zu sein, Solid-State-Drives sinn- und wirkungsvoll zu defragmentieren. Andererseits seitens der internationalen Fachpresse es keinen einzigen unabhängigen journalistischen Artikel gibt, der sich mit dieser Methodik auseinandersetzt. Vielleicht kann hier der Vertrieb von O&O mit Referenzen dienlich sein? Vielen Dank für Ihr Feedback und Ihr Interesse an unserem Produkt! Unsere internen Tests haben gezeigt, dass die Verwendung der Methode SOLID für stark fragmentierte SSDs sowohl für die Leistung als auch für die Lebenserwartung von Vorteil ist. Wir können Sie nur überzeugen, wenn Sie diese Tests auf Ihrem Computer replizieren. Gerne schicke ich Ihnen bei Interesse eine voll funktionsfähige 30-Tage-Lizenz. ich habe ein Macbook mit Parallels, auf dem Windows läuft. Kann ich die Software auf der Windows Seite installieren und damit meine SSD für das Macbook komplett defragmentieren? Oder begebe ich mich dort in ein Problem? Das installierte MacOS benutzt im Normalfall ein Partitionsformat, welches von Windows und somit auch von Defrag leider nicht unterstützt wird. Selbst wenn es für Windows einen Treiber dafür geben sollte, können wir nur die Dateisysteme verarbeiten, welche Windows von Natur aus kann. NEW: Computer Groups function for Avira Antivirus Software and your hardware over the O&O Syspectr Console! NEW: O&O DiskRecovery 14 – Professional-Grade rescue of lost files in almost any scenario! NEW: O&O AppBuster 1.1.1339.2 ! Now with advanced search, displays and more! Free Whitepaper: O&O BlueCon – Professional Disaster Recovery In One Admin Pack. © 2018 O&O Software GmbH, Berlin. All Rights Reserved.